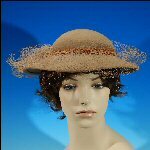 Abe Silverman's Antique Silver Shop offers vintage and contemporarywomens ladies fine silk designer scarves, vintage designer ladies wool felt hats and vintage linen embroidered hankies. The Silk Scarf - Timeless in function and fashion, the silk scarf is as utilitarian today as it ever has been. Silk has stood the test of time in all ages and a myriad of activities. It is lustrous, shimmering and durable. It has good absorbency, which makes it comfortable to wear in all seasons. Silk was first discovered in China around the 27th century B.C., and later moved on to other parts of the world. The fiber produced was so treasured that it became a measure of richness. Silk is the most hypoallergenic of all fabrics because it is a natural protein and contains only 18 amino acids. It is both highly absorbent and easily discharges humidity. So it can keep your skin moist while letting your skin breathe. 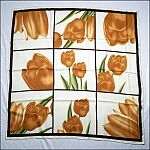 Silk scarves are an extremely pleasant alternative, in terms of the sensation on the skin, to almost any other material. Silk was the fabric of choice for pilots in the early days of aviation. The soft, supple feel of the silk prevented chafing of the neck from flight suit and jacket collars that were buttoned tightly to prevent drafts. The unique slipperiness against the sensitive neck-skin was important to early riders and pilots alike. In cold climates and chilly seasons, silk scarves are worn for warmth. They keep the wind, rain and snow away. There are several effective methods to wrap around the neck and make for a cozy ride down the street. Conversely, in drier, warmer regions of the world thin neck scarves are worn to keep the dust out and to provide a quickly accessible filter whenever the wind picks up or you twist a little harder on the throttle. Silk scarves wrap around the neck and serve as a ready mouth and nose guard, avoiding sand, dust and dirt. Wetted and wrapped around the neck and head, scarves provide a fantastic evaporative cooling experience to combat hot and arid riding conditions. 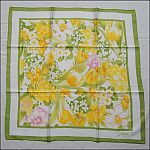 Whatever a person's reason for wearing a silk scarf, they are in good company whenever donning this piece of clothing. Scarves have been worn in all times and places and as long as people have necks this will continue to be the case. Silk fabric was first developed in ancient China, with some of the earliest examples found as early as 3500 BC. Legend gives credit for developing silk to a Chinese empress, Leizu (Hsi-Ling-Shih, Lei-Tzu). Silks were originally reserved for the Emperors of China for their own use and gifts to others, but spread gradually through Chinese culture and trade both geographically and socially, and then to many regions of Asia. Silk rapidly became a popular luxury fabric in the many areas accessible to Chinese merchants because of its texture and lustre. Silk was in great demand, and became a staple of pre-industrial international trade. In July 2007, archeologists discovered intricately woven and dyed silk textiles in a tomb in Jiangxi province, dated to the Eastern Zhou Dynasty roughly 2,500 years ago. Although historians have suspected a long history of a formative textile industry in ancient China, this find of silk textiles employing "complicated techniques" of weaving and dyeing provides direct and concrete evidence for silks dating before the Mawangdui-discovery and other silks dating to the Han Dynasty (202 BC-220 AD). The first evidence of the silk trade is the finding of silk in the hair of an Egyptian mummy of the 21st dynasty, c.1070 BC. The silk trade reached as far as the Indian subcontinent, the Middle East, Europe, and North Africa. This trade was so extensive that the major set of trade routes between Europe and Asia came to be known as the Silk Road. The Emperors of China strove to keep knowledge of sericulture secret to maintain the Chinese monopoly. In the ancient era, silk from China was the most lucrative and sought-after luxury item traded across the Eurasian continent, and many civilizations, such as the ancient Persians, benefited economically from trade. 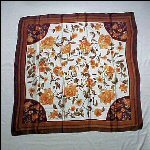 Scarves and shawls have always been collectable - many a Victorian lady treasured her array of fine shawls and wraps, just as fashionable ladies of the 1950s delighted in their collections of printed silk squares. What is the difference between a scarf, a shawl, a wrap and a stole? All four names represent finished pieces of fabric that are worn. They can be made from natural fibers such as silk, cashmere, wool, cotton and linen, or man-made fibers such as acrylic and polyester. Often for decorative purposes, natural and man-made fibers are used in the same scarf; for example, a shiny gold (man-made fiber) thread may be used to embroider a wool (natural fiber) scarf. A shawl refers to a larger item, usually rectangular, but sometimes triangular or square in shape that can be wrapped around the body. Shawls are worn by men and women. They add a lovely finishing touch to an outfit and can be worn for warmth or can be purely decorative or both. A stole is very similar to a shawl. The term probably derives from the ancient Roman stola, which is the woman’s version of the men’s toga. The term stole, today, is usually used to describe a formal wrap, basically a shawl made of an elegant fabric, often not as wide as a shawl, but long enough to drape around the body. The modern term wrap is used for both shawls and stoles. A scarf is a piece of finished fabric or yarn that can be wrapped or tied around your neck for warmth and fashion. Scarves can also be long and thin or not so thin if the fabric is very fine, and tied around your neck to add a decorative accent to your wardrobe. These can be casual or formal fashion accent. 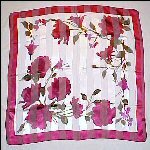 Beautiful silk scarves are used by both men and women for this purpose. Scarves can also be square; small ones, usually around 20.5”, and are called bandanas, neckscarves or neckerchiefs. They are traditionally made of a light material, usually silk, but also cotton and linen. 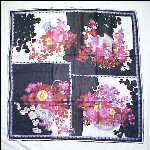 The 36” square scarves are called foulards and are the classic womens scarf, once again usually made of silk, but not always. 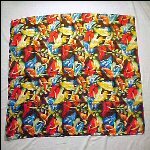 It’s a versatile size that can be worn as a head scarf, or around the neck or waist. Oversized square scarves which are 47” -55” can be worn as a head scarf, wrapped around the shoulders as a shawl or worn around the hips. A handkerchief. hanky or hankie is a square piece of cloth used for wiping the eyes or nose or as a costume accessory. More general versions of the handkerchiefs have been valued since Roman times for their utilitarian functions, but the pocket-handkerchief was created solely as a symbol of beauty and status. 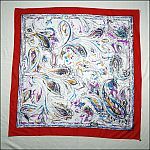 The pocket-handkerchief made its properly genteel debut during a promenade in a public garden, where its creator, an unnamed Venetian aristocrat lady, displayed her handiwork to a crowd of admirers. Word of the comely cloth then traveled across Italy to France, where the expensive, embroidered handkerchief found great favor with the noblemen and women in the court of Henry II. By 1850, the handkerchief was an omnipresent accessory of the German upper crust as well. But it was Marie Antoinette who made history one day at Versailles, when she noted that the square handkerchief was the most attractive and practical variety. Louis XVI then issued a mandate throughout the kingdom that all handkerchiefs must emulate a square shape. Thus, the handkerchief as we now know it was born, and still survives today. 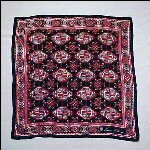 Throughout history, the handkerchief eventually became accessible outside the courts of the monarchy, but was still prized as an elegant, luxurious, and expensive symbol of class and taste. The old needle-made laces are labor intensive, and are rarely made today. Lace should not be confused with the filet lace interpretations copied by bobbins, crochet, and embroidery on fabric. Filet is an ancient lace technique, sometimes referred to as nun's work because it was known to be made in convents. Lace history and lace identification books show wonderful examples of Lacis from as early as the 14th C. One of the earliest references to this work is a cushion of network that St. Paul's Cathedral possessed in 1295, and three pieces of the same work were in use in Exeter Cathedral in 1327. Vintage LINEN HANKY / Hankie Embroidered, Cutwork and Crochet Lace Set of Four (4) 11.5" x 11.5"
Vintage VERA NEUMANN Taupe Scarf with Wheat & Leaves 21.5" x 20.5"
Vintage ANNE KLEIN 100% Silk Scarf Aztec Design in Black, Red, Silver & White 25.5" x 25.5"
Vintage 100% Chinese Silk Scarf QIANTAIXIANG SILK Peony Flowers Fall Colors of Brown, Orange, Peach, Green & Burgundy 45" x 45"
Vintage LIZ CLAIBORNE Equestrian Fox Hunt 100% Silk Scarf 31" x 31"
Vintage Colorful 42" Square Silk ELEPHANT EAR (Caladium Leaf) Scarf or Wrap - Vibrant Fall Colors! Hand Printed Asian Chinese Black Silk Floral Scarf BASKETS OF FLOWERS Hand Rolled Edges 28.5" x 28.5"
Large Vintage Ladies Korean BURGUNDY RED ROSES Polyester Chiffon Scarf or Wrap 41" x 41"
Vintage 1980's Camel DOESKIN 100% Wool Felt Ladies / Women's Designer Hat with Tan Lace Netting, Geo. W. Bollman & Co. U.S.A.
Vintage 1978 AVON Designer Floral Spring Ladies Scarf by SW Kent 27" x 27"
Vintage 1960s Veresa by VERA NEUMANN Blue & Yellow Floral Polyester Ladies Scarf Japan 28" x 27"
Vintage NORMA DORI Italian Abstract Floral Paisley Silky Ladies Scarf 35" x 34.5"
Vintage Fine Wool Ladies Taupe Paisley Fringe Wrap or Shawl 89" x 44"
Pair Creamy White Cotton Linen Embroidered Ladies Hankies with Lace Edges 11" x 11"